Outdoor fireplaces are becoming more and more popular. You might think they are the fad of the moment but the homeowners who we’ve built outdoor fireplaces for tell me it’s the best investment they ever made. Sure there is some novelty. Your friends will be very interested, or even anxious, to share a meal, glass of wine, or a board game on the patio where your outdoor fireplace stands. They’ll want to see if it throws heat or if the heat gets lost in the cooler air that spans the distance. They’ll want to see how clearly they can hear the crackle of the flames while socializing. Like an indoor fireplace, the amount of heat felt is easily adjusted by moving closer or farther away from the fireplace. And, like an indoor fireplace, the sound of the crackle of the fire can be heard more easily when other noises are reduced. But the feature of the outdoor fireplace that needs to be experienced for full appreciation is the sense of “romance” that a crackling outdoor fireplace creates. Think about your first camping trip and the feeling of sitting around a fire and smelling the sweet aroma of burning firewood through the cool night breeze. Think about the first time you sat in front of a fireplace with a date. The magic is magnified with the romance of a burning fire in a fireplace. The design decisions you will want to consider are the material, size, and adjacent area. 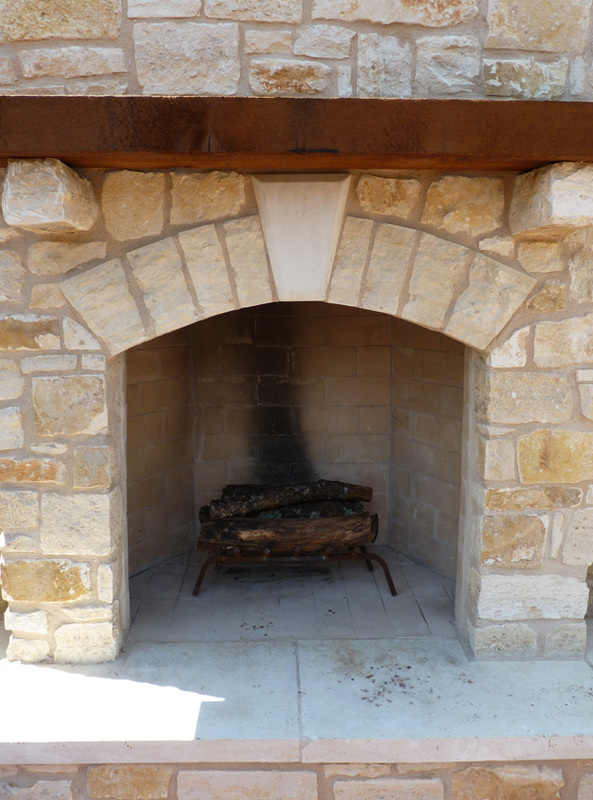 Your outdoor fireplace needs to be built with a fire safe material – concrete, stone or brick. We can build using a combination of these materials to attain the design sense you are seeking. As you can see, this particular fireplace is a substantial size. That’s because this family wanted the fireplace to double as a privacy wall. You also want to consider the adjacent area. Do you want built-in seating? Do you want a built-in area for keeping logs? Do you want to build in room for cabinets to keep other fireplace items such as matches? The great thing is you only need to have some ideas when we have our design consultation. We have a great deal of experience in designing and building and you have many ideas about what you want. Put together, this amounts to a great design and build that’s just the way you like it. This entry was posted on October 18, 2010 by austinporchandpatio. It was filed under Built-in benches, Built-ins, Outdoor fire place and was tagged with Archadeck of Austin, Austin flagstone patio, flagstone outdoor fireplace, outdoor fire pit, outdoor fireplace.